Many large-scale companies are tying up with transport agencies and firms for sailing their goods which help in transporting liquids. Large vendors are adopting various strategic alliances for cementing their foothold in the global metal IBC market. A few inventive strategies adopted by players in the global metal IBC market to achieve an edge in the industry include collaboration with transport channels. The rivalry among players is getting escalated due to the entry of several local players who are concentrating on providing high-quality products. They are also focusing hard on attracting new consumers to their businesses to steal a march over their competitors. According to experts from TMR, the global metal IBC market is expected to gain revenue worth US$1,995.0 mn by the end of 2027. The market was valued US$1,334.4 mn in 2017. Experts project this growth to occur at a steady CAGR of 4.10% during the forecast period from 2017 to 2027. Among various material types of metal IBC, the stainless steel section is expected to boost the metal IBC market during the forecast period. This is because of its better tear and wear properties and low value. With respect to geography, North America is expected to account for a leading share in the global metal IBC market in the coming years. This is attributed to the growing demand for advanced transportation options and flourishing end-use industries in the region. Metal IBCs are the containers which are mostly made up of carbon steel or stainless steel and are mainly utilized in bulk transportation. Such containers have become the crucial element in cross border trade practices. Metal IBCs are highly utilized in various end-use industries and it helps in transporting bulk liquids such as industrial chemicals. These containers help in minimizing spillage and snapping cases to a great extent. Such USPs are driving the global metal IBC market. Along with these, rising trade activities and manufacturing sector output which requires the good quality of containers for importing and exporting purposes are also fueling demand in the global metal IBC market. Furthermore, metal IBC helps in reducing costs for the various shipping industries which is further propelling expansion in the global metal IBC market. Apart from this, rising use of RFID technology in tracking and tracing the IBCs also helps in saving costs as well as enhancing customer services. 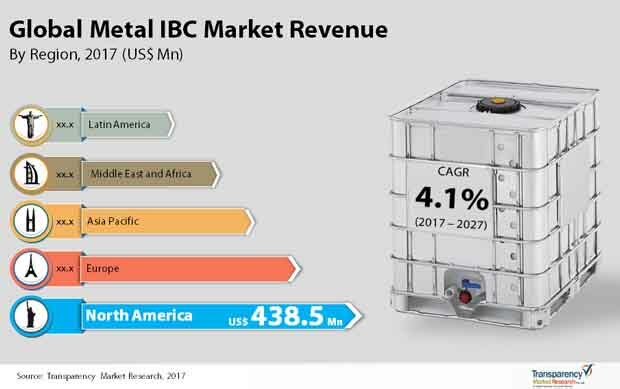 All such factors are also boosting the global metal IBC market. Metal IBCs are extensively utilized in transporting various industrial materials. Due to the high quality and various advantages, such containers are majorly used in transporting paints, industrial chemicals, inks, food and beverages, dyes, lubricants, petroleum, pharmaceuticals, waste disposal, and construction. Moreover, metal IBC are also highly utilized for the transportation of hazardous chemicals. Such factors are also fueling growth in the global metal IBC market. The review is based on a market research report by TMR, titled, “Metal IBC Market (Material Type - Carbon Steel, Stainless Steel; Capacity - Up to 500 L, 500 to 1000 L, 1000 to 1500 L, 1500 to 2000 L, Above 2000 L; Design - Cubic, Cylindrical; Content - Liquids, Solids and Semi Solids; Technology - Aseptic, Non-aseptic; End Use - Industrial Chemicals, Petroleum and Lubricants, Food and Food Ingredients, Building and Construction, Waste Disposal/Recycling and Silage, Pharmaceutical, Paints, Inks, and Dyes) - Global Industry Analysis and Forecast 2017 - 2027”.